Lumberjack Brawl American Wheat and Lime Rock IPA will be available in 16 oz. four-pack cans May 2018! In 1870, Silver Jack Driscoll and Saginaw Joe Fournier squared off in the most legendary brawl in Michigan Lumberjack history at the Red Keg Saloon. No one is sure who started the brawl, but we do know they fought for two hours and settled their dispute over a beer! Midland Brewing Company pays tribute to this celebrated brawl with our full-flavored, refreshing brew: Lumberjack Brawl American Wheat. Brewed with Tahoma hops, orange peel, and coriander, this wheat ale is perfect to quench your thirst after a long day of log-splittin’, axe-grindin’ – and maybe even brawling! 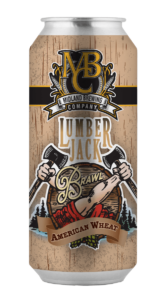 Lumberjack Brawl American Wheat will be in released in 16 oz. four-packs from May to late Fall. All aboard for citrus refreshment! During the Michigan logging boom, white pine from the Saginaw Valley was shipped all over the Midwest and New England. Lime Rock IPA was named for the Lime Rock Railroad -the farthest logging rail stop in Rockport, Maine. Lime Rock IPA features Citra and Michigan Chinook hops for a juicy, citrus character reminiscent of a New England IPA while maintaining the hop bitterness of a traditional IPA. Fresh enough to last ’til the end of the line! Lime Rock IPA will be available in 16 oz. four-packs beginning this May.